Daxxín AB is a Swedish company located in the city of Gothenburg. Daxxin AB develops, manufactures, distributes and markets modern hygiene products within hair care, body care and skin care. The company is a member of KTF (Kemisk Tekniska Leverantörföreningen i Sverige) The Supplyer´s organsation for Cleaning products and Toiletries products in Sweden, meaning that we as an associated company, commit ourselves to follow the actual rules and laws regarding this business in Sweden as well as in Europe, as the KTF being a member of the COLIPA, who is the corresponding European business organization. 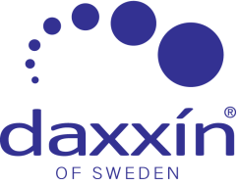 Daxxin AB´s products are registered at the Svenska Läkemedelsverket, LMV, i.e. the medical products agency authorized by the Swedish government. Daxxin AB is a `Pi-hållare`.i.e. the responsible holder and supplyer of the product information to medical doctors, hospitals and authorities. Daxxin AB´s products are safe for their users thanks to their product formulations and only using approved ingredients with a of top quality standard. The mild scent is of a classified allergen free perfume. Daxxin AB´s products are only sold and distributed at the pharmacy sector. The reason is that when being a client with skin-or hair problems, we do recommend the clients to turn to the specialists at the pharmacies where you will receive necessary and competent consulting from people who are able to give individual advices to each person with specific problems This consulting you can receive at the pharmacies from Chemists, Pharmaceuts.,Pharmacy Technicians and sometimes even medical care people such as Medical Nurses and Medical Doctors. They will be able to identify the problem and give their advice to what kind of treatment they will recommend in order to solve the clients problem as soon as possible. Daxxín AB´s products are distributed to the pharmacies via logistic companies within the pharmacy sector such as ApoPharm, Oriola and Tamro, all dedicated to supply with short lead times and high handling efficiency and speed as well as for the highest distribution safety. 43 boxes per layer x 5 layers = 215 boxes per pallet = 1290 pcs per pallet.